"Nutrition is the make-or-break component of training," says sports dietician Sunny Blende, MS. While a pre-run bacon cheeseburger will slow you to a sputtering pace, the right foods can get you firing on all cylinders. In the same way that you might start a new stretching routine to accommodate an aching muscle, you can rely on certain foods to provide specific physiological advantages. What you eat can work like magic to make you feel your best. Whether you want to get faster or combat cramping, reach for the following items in order to grab hold of your goals. You'll soon find that small changes in your diet can spell major jumps in performance and recovery. Carbohydrates are one of the best sources of energy for runners. Once ingested, they are broken down and used to fuel your workout. The leftovers are stored as glycogen in the muscles to be drawn upon later in a long run or race. One study from Auburn University put this to the test by providing various amounts of carbohydrates to cyclists prior to a 20K time trial. The athletes who consumed the most carbs were also the fastest. Quinoa is a particularly good choice. This whole grain, native to Peru, delivers complex carbs along with plant-based protein, and it contains very little sugar and no gluten. *Try This: Mix one cup cooked quinoa with 1/4 cup dried cranberries and 1/4 cup chopped celery. Drizzle with lemon juice and olive oil. The high level of vitamin D found in wild salmon may assist in increasing muscular strength. In a study from Wake Forest University Medical School, participants with greater levels of vitamin D in their blood streams displayed better handgrip strength. This delicious fish is chock full of other nutrients that are good for your health. "Salmon is high in omega-3 fatty acids so it can strengthen your heart as well," explains Jennifer Gill, an RRCA-certified distance running coach. Be sure to choose wild rather than farmed salmon, as it contains significantly more of those sought-after vitamins. 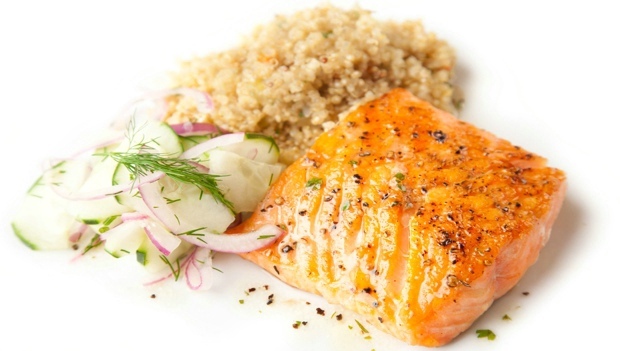 *Try This: Rub a one pound wild salmon fillet with a mixture of olive oil, chopped garlic and grated ginger. Roast in a 400°F oven for 12 minutes, or until the center of the fillet turns opaque. A UK-based study solidified the link between muscle recovery and cherry juice. 20 marathon runners were assigned to drink either tart cherry juice or a placebo drink during the week leading up to the London Marathon. Those who consumed the juice recovered more quickly and displayed less inflammation. Nancy Clark, sports nutritionist and the author of Nancy Clark's Food Guide for Marathoners, suggests that other antioxidant-rich juices may have the same effect. Try grape or berry juices if the cherry variety is hard to find or too expensive. *Try This: Mix equal parts cherry juice, almond milk and ice in a blender. Mix until smooth.